Come September 1st in the Greater Daglan Area, it’s as if someone closes the shutters all at once. The curtains come down. The door is slammed shut. In other words, after the two months of July and August, the Tourist Season is over. This takes a bit of getting used to, for a few reasons. Perhaps most notably, businesses aren’t open as much, or for as long. This means we have to plan our shopping a bit more carefully. For example, Daglan’s 8 à Huit convenience store is now closed on Mondays, and its business hours aren’t as generous. The bio (organic foods) store in St. Cybranet is also closed on Mondays now. Closed on Mondays, as the Season ends. 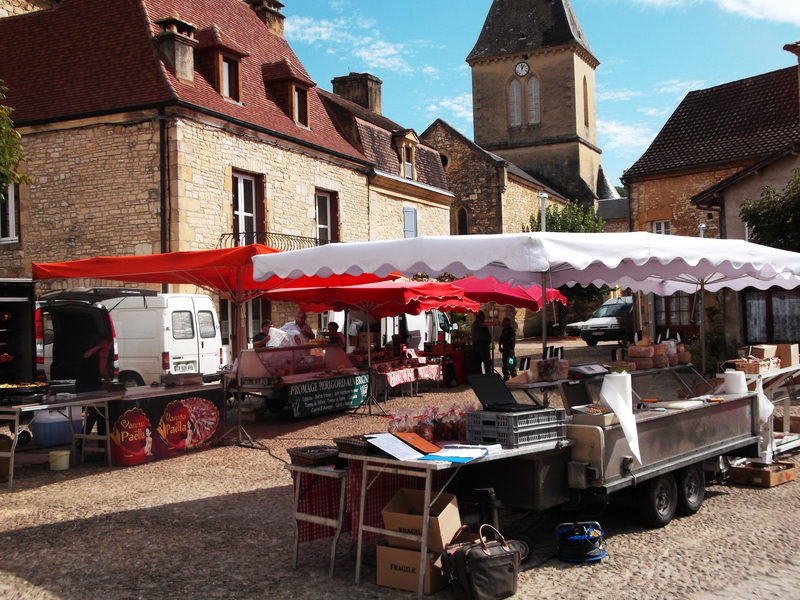 Daglan’s Sunday market — but where are the shoppers? 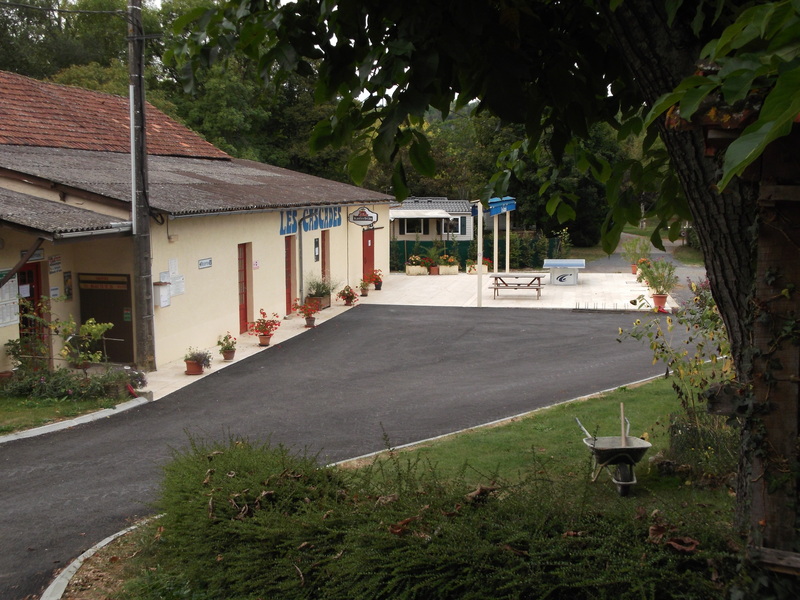 Campgrounds like Les Cascades are empty, or nearly so. Now that we’re at mid-September, there’s a change in the air too. Actually, the weather has been just about perfect lately — with cool, almost cold nights, cool mornings, and warm, sometimes hot, days. 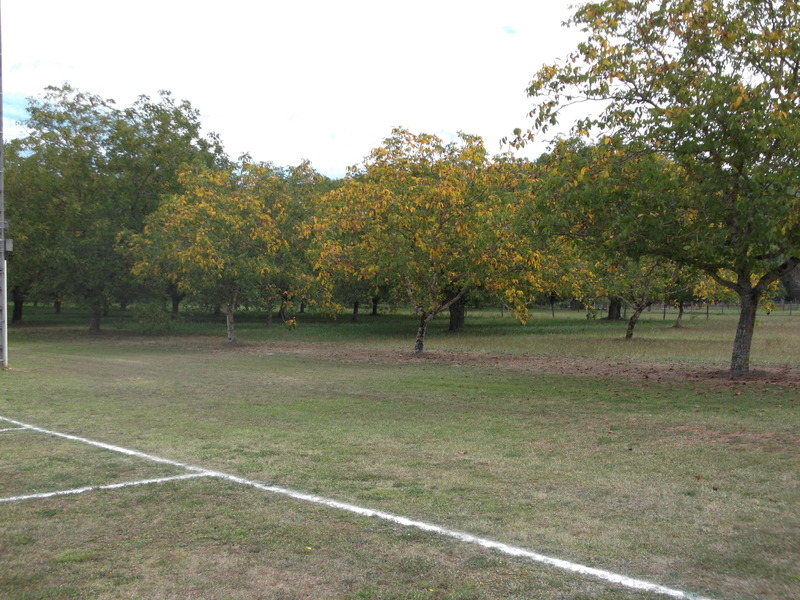 The walnut tree leaves are just starting to show yellow. 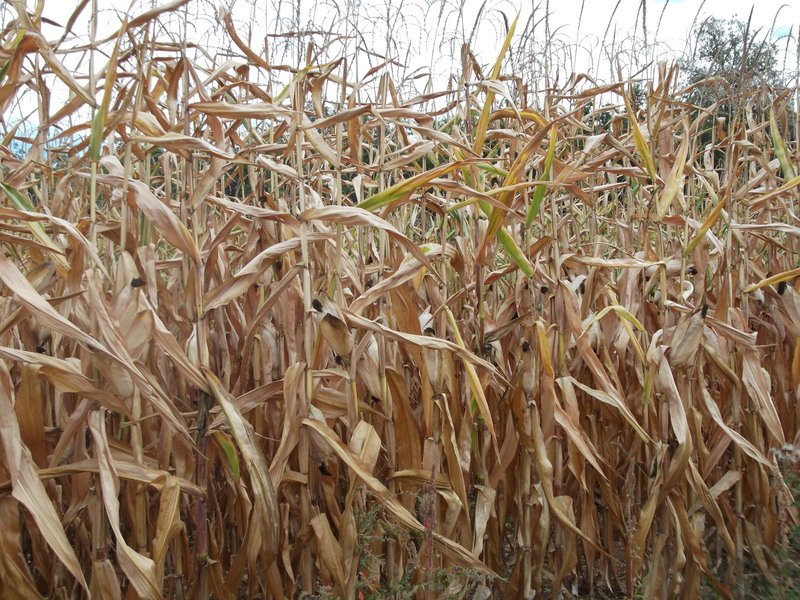 This field of corn is ready to be harvested — and soon! 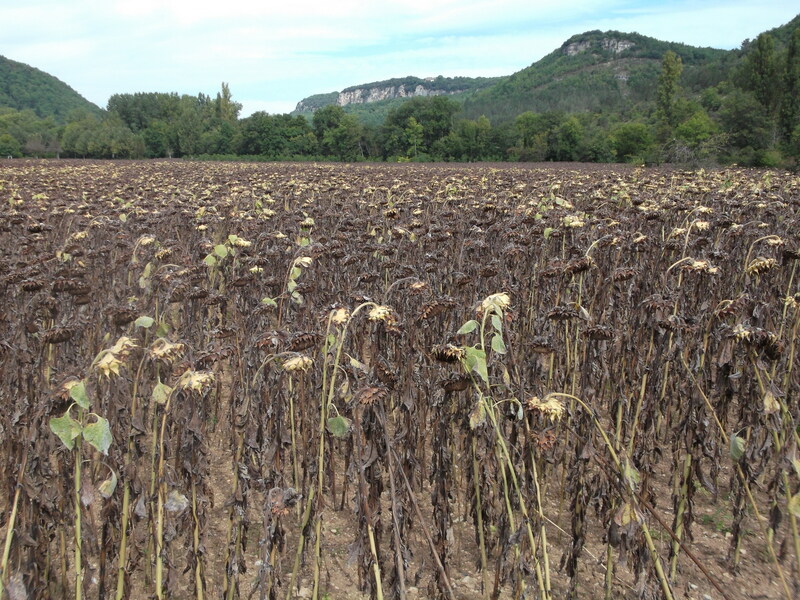 A sad-looking field of sunflowers in St. Cybranet. Of course it’s not all gloom and doom. Despite the closed-for-business Mondays, I still maintain that September is the best of all possible months to visit the GDA. Without the hordes of tourists, traffic is much lighter, the weather tends to be good, and it’s easier to get into restaurants and various tourist attractions. 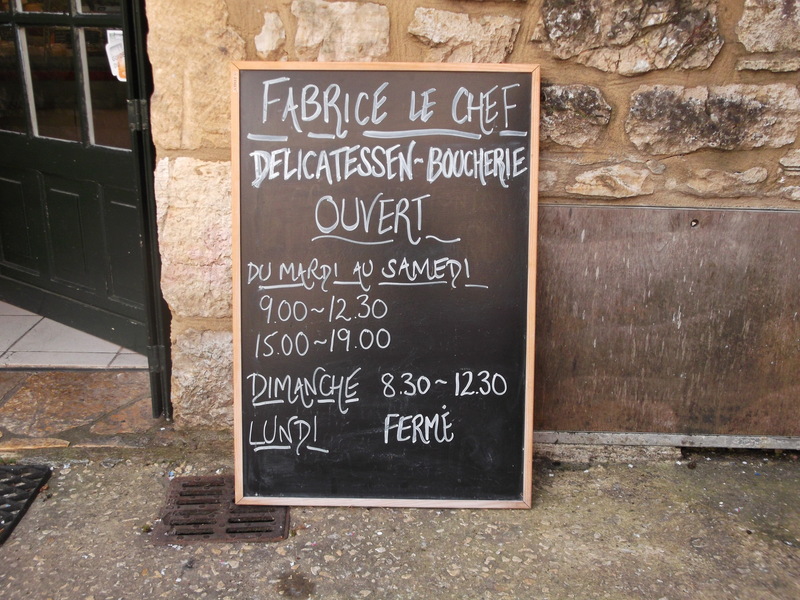 In Daglan itself, the popular tea salon Le Thé Vert is open all of September (every day but Wednesday), and seems to be doing a brisk trade throughout the day, especially at lunch time. On the home front, we are expecting two more sets of guests before the month ends, so there’s lots more sightseeing and fine dining to come. 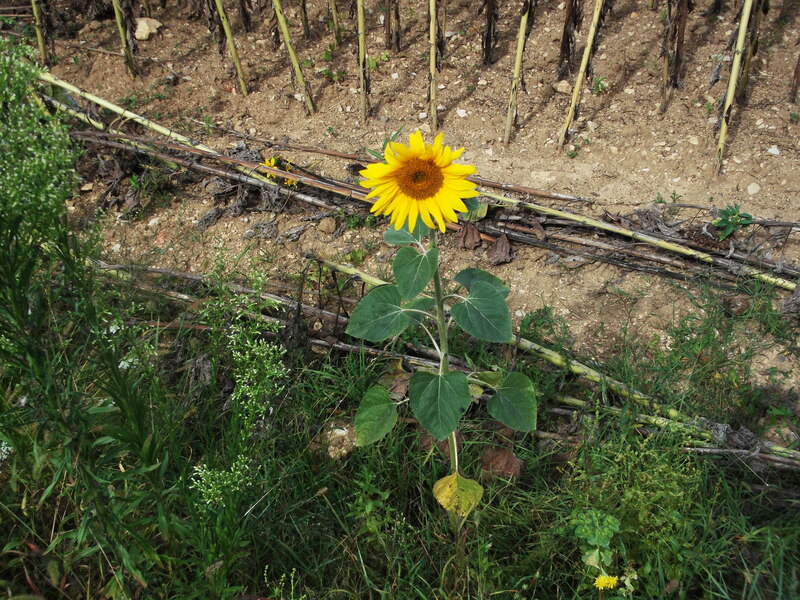 One little sunflower has managed to stay sunny. This entry was posted in Agriculture in the Dordogne, Flora and fauna, Holidays in France, Life in southwest France, Markets in France, Travels in and out of France, Weather in the Dordogne and tagged campgrounds, Daglan, Dordogne walnuts, Dordogne weather, Fabrice le Chef, flowering trees, flowers, Le Thé Vert, Les Cascades, nature, plants, Sunday markets, sunflowers, walnut groves, walnut trees, walnuts, weather. Bookmark the permalink. Must say, it is nice to read your blog and actually know what and where youre writing about, almost unreal that all the tourists are gone and saddest of all – the sunflowers!! They were so beautiful, thinking of you guys preparing to bunk down for winter, fortunately for us in SA, Spring is here and we are all looking forward to Summer to follow, how blessed we were to experience a brilliant Summer in France, just what the doctor ordered to eliminate the winter blues! There is still lots of time this year for us to enjoy Daglan — but we may indeed be visiting South Africa next year. Stay tuned! We’d love to see you again, and soon! As the little sunflower suggests, I’m not at all sure that things in and around Daglan are quite so dis-spiriting as the general tone of you blog!! We have just returned to UK after two weeks or so near Daglan and wish we were still there. This year we got the impression that there was a significantly larger number of English people than usual in and around Daglan, including more now resident there. Perhaps not the case, or perhaps your blog is encouraging more people to visit. Any ideas? I didn’t mean to be too negative — but it is indeed a fact of life here that things start to close down immediately after the first of September. As I wrote, the weather now is absolutely great, so I\m sorry you’re back in the U.K. already. Not sure about the proportion of English tourists. Seemed about “normal” to me. But all are welcome! Great article. We’ll visit one day…. Thanks, Michael. Look forward to showing you the Greater Daglan Area!